as God called her home to rest forever close to His heart. Have tissues handy before watching THIS VIDEO. Lauren left a permanent, unforgettable mark of kindness upon our world. Even in her darkest days, her mind was tirelessly upon others who are suffering. She gave until she could literally give no more. Such a dear, precious, sweet girl. Lauren has run her race and finished her course, leaving behind memories of a selfless life. Only the dear Lord will ever know the full extent of the reach of her influence and positive spirit. and all who grieve today and mourn her passing. May the God of all comfort hold them extra close and somehow make them see how much they are loved and supported during the difficult days that lie ahead. Let us pray hard for Lauren's family and loved ones and all who were touched by her passing. You left this world a better...kinder place. We will forever cherish your memory in our hearts. To read more about Lauren's story and previous posts about her, click the links below. Sad....and a blessing too..... one of those bittersweet moments. She is in a wonderful place... no more pain-may God comfort those she left behind and carry them through.... and may He be glorified. Yes, my heart just goes out to them so much. May God have mercy upon them all and keep them close to Him. Thanks for stopping by...I am praying for you! I hadn't heard. You were right about the emotions that the video would bring. This brought my heart to life today... I'm praying for her family. We'll see her sooner that we can even imagine on this side of Glory. You are so right, Floyd. I believe His coming is quickly approaching. What a day that will be! So thankful for your visit and encouragement. God bless you. so sad. I'll be thinking of her as we do the next brain cancer race! Yes, bless your dear heart, you surely know how this family feels. God bless you, Caroline. I am praying for you. I just read about this. So sad for all of us left behind on this side of eternity. But I can only imagine Lauren meeting her Savior face-to-face for the first time! Maybe they're playing a pick-up game of basketball! Prayers will continue for her family and friends. And let's pray that the spiritual legacy she left behind will spread the Good News to many. Thank you so much, sweet friend. She did so much good and was instrumental in raising so many funds for other sufferers. God be with this dear family and hold them close. I am so grateful for your visit and kind words. Much love to you....I'm praying for you. Such sadness for Lauren's family and friends on earth -- such glory for Lauren. "Just think of stepping on sure, and finding it heaven." Heaven has more pull since my mother's arrival there in November. Hi Cheryl! This was such a story of triumph to me. This young woman just shone, didn't she? And she captured the love of so many in the world. I wonder how her parents raised such an amazing daughter. I pray that I did half the job that they did. Lord, comfort her family, friends, and all who loved her. She's home in Heaven and forever with the Lord. We will meet one day. 1 Corinthians 2:9 But, as it is written, "What no eye has seen, nor ear heard, nor the heart of man conceived, what God has prepared for those who love him. Thanks so much for sharing, Cheryl! 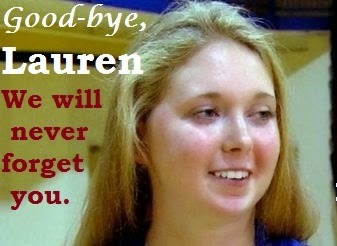 How sad for her family, but Lauren is now healed completely. This video just really touched my heart! !